Johnson, from Broughton, near Brigg, was deputising for the injured Jordon Weaving and used the track time as a shakedown test prior to the start of the international road racing season which gets under way this week. After completing qualifying for a start from the 11th row of the grid, it was always going to be an impossible task for Johnson to make much impact on the race, but he got his head down and began to reel in the riders ahead. By lap five he was up into the top 20, but made a mistake and ran on at the chicane, dropping him back down the field to 30th on lap nine of 15. Once again he made headway through the field and crossed the finish line in 24th position. 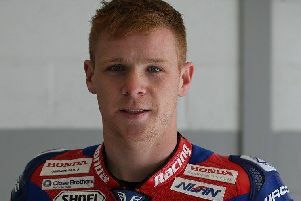 Johnson now travels to Northern Ireland for the North West 200 which takes place on the public roads around Port Stewart, Coleraine and Port Rush on Saturday. He will ride the Briggs Equipment Kawasaki for the RAF Regular and Reserves team.